Doesn’t take long for this crew to gobble it up! Since we can’t call breakfast – dessert…. I call it… A treat? It’s a sneaky way for me to get more healthy fats into them, and make sure they’re getting enough calories too. 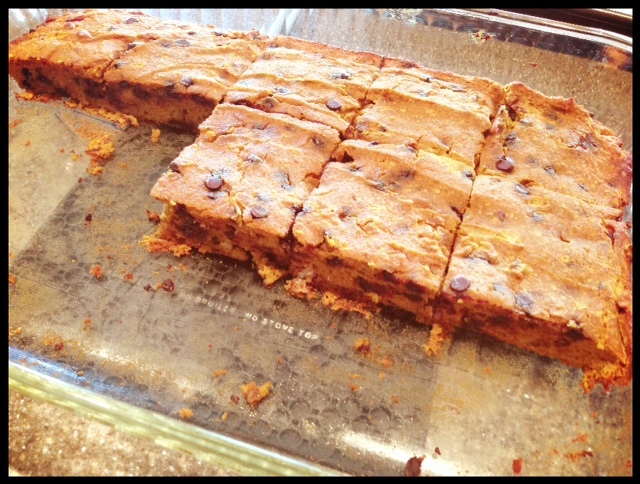 One of my favorites (and theirs) is pumpkin paleo bread, or CAKE… let’s call a spade, and spade. 🙂 I add in pecans (and chocolate chips) to whatever I can – so they can get some added fats, and feel like it truly IS a treat. Pour into a 9×13 glass dish, grease with coconut oil . Bake at 325 degrees for 28-32 minutes. Posted on July 8, 2013, in Auto Immune Disease, Celiac/Gluten Sensitivity, Food To Try and tagged auto immune disease, celiac disease, enjoy life chocolate chips, healthy for him, Paleo Cake, Pumpkin Cake, Pumpkin Paleo Cake. Bookmark the permalink. 4 Comments. Sara, my family made this cake today. The kids enjoyed making it and waited by the oven, with the light on, watching it bake. They inhaled it in a few bites, and asked for seconds. Success!